Puu Puai Overlook, Kilauea Iki Caldera, Hawaii. Very Clear and Very Windy in Caldera. Hazy but Clear to the South. 80mm Stellarvue Refractor, TeleVue Eyepieces. Travelling to Hawaii, I had intended to observe as many of the northern objects as I was able to with my 80mm Stellarvue Refractor which I had brought with me for that purpose. Despite early cloud on the Kona Coast, the Kilauea Caldera was clear of cloud but the wind was very high. The wind chill was high but we had prepared, bringing polarfleeces to Hawaii!! Finding an excellent observing site at the Puu Puai Overlook which was sheltered from the swirling wind we quickly set up and the skies were black with no lights for some kilometers. Tucking up against the trees, the local area was calm with occasional gusts. Being in the middle of a sparsely populated island in the middle of the Pacific Ocean made for very contrasty sky. No UHC filters needed here. The first priority was to get the missing Messier objects observed and then as many Caldwell objects that could be observed through 80mm of aperture. Armed with my secondhand Uranometria North (Which arrived on the slow boat from the US with 3 days to spare) and extensive maps I had prepared I went to it. Two separate observing sessions were completed in the one evening; A 9PM to 10PM session and a 3:30AM to 5:00AM. NGC 4236-1 Galaxy 20x Very tough skinny galaxy glimpsed at low power only. Adverted vision a necessity. Persevered with this object as it was the first very difficult object and I can say it was observed but only due to the very good transparency and the fact the Moon was nearly set at the time. Too little aperture to describe details. Caldwell Object. NGC 2403 Galaxy 20x Fainter galaxy which is fairly large and has a growing brightness toward the core. Fairly easy to find. Caldwell Object. M 97 Planetary Nebula 44x Round, Messier planetary with an even brightness. In the same field as the Messier galaxy M108. M 82 Galaxy 20x Easily seen, a contrasting pair of Messier galaxies in Ursa Major. Beautifly framed in the 11mm Nagler, M81 is fat oval and M82 is a enlongated oval. Galaxies very similar in brightness, but M82 is slightly fainter. No detail noted. Northern Messier Object not seen from New Zealand. M 81 Galaxy 44x Easily seen, a contrasting pair of Messier galaxies in Ursa Major. Beautifly framed in the 11mm Nagler, M81 is fat oval and M82 is a enlongated oval. Galaxies very similar in brightness, but M81 is both larger and brighter. No detail noted. Northern Messier Object not seen from New Zealand. M 51 Galaxy 69x One of the highlights for the evening. The Whirlpool was to be a real treat and had been anticipated for weeks. Observed at all power the object was bright defined and had very good detail including a stellar core, despite the small aperture. 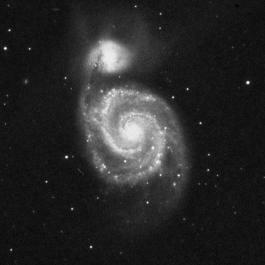 The comapnion of M51, NGC5195 is easy to separate and almost look joined with the 11mm Nagler and lower. M 40 Star 44x Very boring Messier Object, being a double star. Observed for the record. M 109 Galaxy 44x Toughest of the Messier objects seen tonight. A small insignificant smuge SE of Gamma Ursae Majoris, a Dipper star. Very hard to spot with the bright star in the FOV, but moving the scope to one side enabled a sure identification. M 108 Galaxy 44x An easy elongated oval Messier galaxy with a hint of irregularity. The round planetary nebula M87 lies in the same FOV and makes a contrast in shape with both objects being similar in brightness. M 106 Galaxy 44x Bright Messier galaxy. Easy. Large oval with a condensed core and excellent irregulat detail despite small aperture. M 102 Galaxy 20x Oval shaped Messier galaxy, not overly bright, small and even in brightness. Often called the missing Messier object. M 101 Galaxy 20x The Pinwheel. An amazing round galaxy with a very faint halo and a bright core. Best veiwed at lower power. Relatively easy to spot and another highlight of the evening. NGC 7243 Open Cluster 44x Large disperse open cluster with no real features. Caldwell Object. NGC 7000 Bright Nebula 20x The North American Nebula almost at it's highest was superb. Just on naked eye and a extensive milkyness across the FOV was clearly noted. Not diffcult and suprising contrasty. No 1 1/4 inch filter was taken with me so extra contrast was not available. Caldwell Object. NGC 6946 Galaxy 44x Round galaxy not difficult to spot and is contrasted by a nearby open cluster (NGC6939). Very similar in brightness and size. The galaxy has stars involved with it so detail in the halo is difficult to detect. Caldwell Object. NGC 6939 Open Cluster 44x Open cluster near a galaxy, eaily in the same FOV (NGC6946). Very similar in brightness and size to the galaxy. Slightly resolved. NGC 6826 Planetary Nebula 44x Small planetary nebula with a bright evenly bright disk. Fairly easy to find and responded well to extra power. A fraction fainter than the Cats Eye just seen in Draco. Caldwell Object. NGC 6543 Planetary Nebula 44x Small planetary nebula with a bright evenly bright disk. Fairly easy to find and responded well to extra power. Caldwell Object. M 39 Open Cluster 20x Bright Messier Open Cluster with 15 or more bright stars. Very white and bright. No other coloured stars noted. IC 5146 Bright Nebula 44x Bright Nebula on the end of B168. Realtively faint but distict because of the blackness of the dark nebula. Fine object. Caldwell Object. IC 5067 Bright Nebula 20x The Pelican nebula was fainter than the North American and was clearly a separate object however it was faint. Suprising to actually see this object through the 80mm. B168 Dark Nebula 20x Dark Nebula noted which is involved with the Coocon Nebula. Streaking across the FOV from one side of the eypiece to the other, it has a larger darker eastern end which has the bright nebula at the end. NGC 884 Open Cluster 20x The Double Cluster. A real treat. A beautiful widefield view of a object of stunning propotions. Clusters are very large and vey bright dispite a very starry field. NGC869 is slightly more compressed and compact but this is hardly noticable. Just Beautiful !! NGC 869 Open Cluster 20x The Double Cluster. A real treat. A beautiful widefield view of a object of stunning propotions. Clusters are very large and vey bright dispite a very starry field. NGC869 is slightly more compressed and compact but this is hardly noticable. There are some bright yellow core stars in the centre of NGC869. Just Beautiful !! Caldwell Object. NGC 7662 Planetary Nebula 44x Another very similar planetary nebula as I have already seen. Small disk with an even brightness. No colour noted. Caldwell Object. NGC 7023 Bright Nebula 44x Small pacth of nebulosity. Very faint and not easy to spot. Caldwell Object. NGC 663 Open Cluster 44x A loose open cluster with members of similar brightness. There is a distinct 6th Mag star to the NW. Caldwell Object. NGC 559 Open Cluster 44x Hazy spot, not resolved at any length although easy to spot. Caldwell Object. NGC 457 Open Cluster 44x A fairly bright although compact open cluster. A bright colour contrasting star lies on the southern side. Caldwell Object. NGC 40 Planetary Nebula 44x Slightly oval shaped PN with an even brightness. Quite distinct from the background stars. Caldwell Object. NGC 185 Galaxy 44x Contrasting pair of galaxies that fint into the same FOV. NGC147 is quite difficult while NGC185 is fairly easy. Milky hazy looking galaxies with even brightness. Probably elliptical. Caldwell Object. NGC 147 Galaxy 44x Contrasting pair of galaxies that fint into the same FOV. NGC147 is quite difficult while NGC185 is fairly easy. Milky hazy looking galaxies with even brightness. Probably elliptical. Caldwell Object. M 92 Globular Cluster 20x A difficult northern globular to spot from New Zealand. Caught up with you again under different circumstances. Not resovled to any degree. M 76 Planetary Nebula 44x An irregular Messier planetary nebula. Similar in nature to the 'Spiral' this object is box shaped with irregular indentations, similar to a cashew or peanut. This object is bright and very nice. This observation completes the Messier catalog for me. Yippee !! M 52 Open Cluster 44x Compact Messier open cluster. Has distinct yellow stars although a prodominantly white star cluster. Nearby NGC7635 not seen. M 31 Galaxy 20x Nice view of the Andromeda Galaxy. Twilight starting to take effect on contrast and you can visibly see the contrast sap away the detail as you look through the scope. M 103 Open Cluster 44x Compact Messier open cluster. Triangluar in shape this cluster is nice but not bright bright. In an area over populated with open clusters. Not your thing Guy !! Well the purpose of the observing was to observe all the missing Messier object not seen from New Zealand. My Mission was successful with M76 the last object observed to complete all 110 Objects (Including the replacement for M102, the missing Messier object). Highlights would have to be M51 the Whirlpool Galaxy, M101 Pinwheel and the Double Cluster. These Objects were simply outstanding. Of the objects observered NGC4236 & M106 really pushed the limits of the 80mm scope. Contrast added extra inches to the aperture. I also added M31 and M92 to the observed list as these objects normally are low in the north. M92 was very high compared to the southern latitudes and M31 was not up high at all slowly disappearing with the creeping dawn.